President Trump derided Bill McRaven, who recently left his post as chancellor of the University of Texas, as a “Hillary Clinton fan” and an “Obama backer” before suggesting that the four-star admiral should have caught Osama bin Laden faster. President Trump has long put the American military at the center of his presidential brand, tapping retired officers to serve as advisers, touting increases in defense spending, and citing support from troops and veterans as a sign of his success. But the commander in chief has risked alienating parts of the military community by escalating a fight with one of its most revered members, retired Adm. William H. McRaven, amid other recent remarks and decisions that have fanned controversy in the ranks and among some who served. In an interview with Chris Wallace on “Fox News Sunday,” Trump went after McRaven, the retired Navy SEAL and Special Operations commander who oversaw the killing of Osama bin Laden and the capture of Saddam Hussein during his 37 years in the U.S. military. Trump derided McRaven as a “Hillary Clinton fan” and an “Obama backer” before suggesting that the four-star admiral, who recently left his post as chancellor of the University of Texas amid a battle with chronic lymphocytic leukemia, should have caught bin Laden faster. The comments escalated a war of words that began last year when McRaven called Trump’s description of the news media as the “enemy of the people” the greatest threat to American democracy he had ever seen. This past summer, McRaven went to bat for John Brennan, defending the former CIA director as a man of integrity in an article in The Washington Post, after Trump revoked Brennan’s security clearance. In a statement initially released to CNN and confirmed by The Post, McRaven said he didn’t back Clinton or anyone else in the 2016 presidential election and was a fan of Barack Obama and George W. Bush, both of whom he worked for while in uniform. 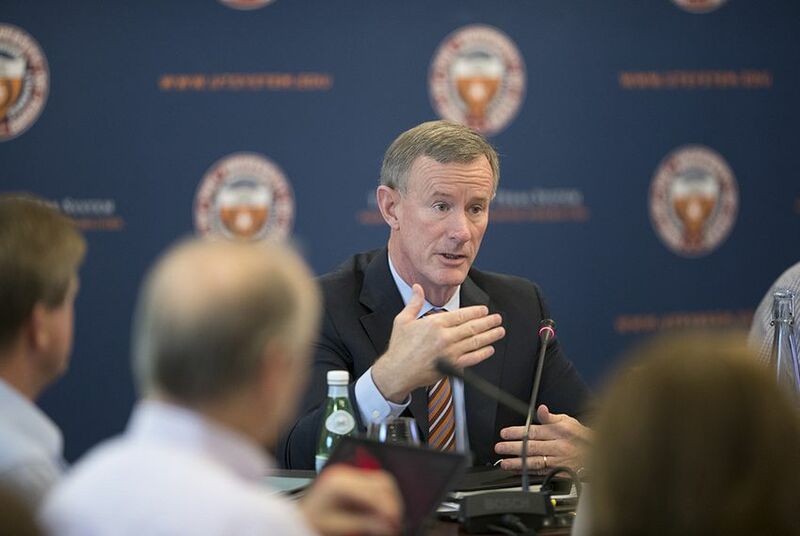 “I admire all presidents, regardless of their political party, who uphold the dignity of the office and who use that office to bring the nation together in challenging times,” McRaven said. Former CIA deputy director Michael Morrell pointed out on Twitter that McRaven’s forces had nothing to do with locating bin Laden. Morrell said it was the CIA that did the “finding” and McRaven’s forces that did the “getting,” moving out within days of receiving the order. The president’s remarks about McRaven came amid broader questions about Trump’s relationship with military matters. During a recent trip to France, the president didn’t attend a ceremony commemorating the centenary of World War I because of the rain, with the White House saying his helicopter couldn’t fly in the inclement weather and a motorcade would have caused too much traffic. Chief of Staff John F. Kelly and Marine Gen. Joseph F. Dunford Jr., chairman of the Joint Chiefs of Staff, attended the ceremony. Trump didn’t visit Arlington National Cemetery to mark Veterans Day this year because he was traveling home from France and didn’t go to the ceremony or hold any public events to honor U.S. veterans on the Monday holiday. Trump admitted he should have gone to Arlington National Cemetery to mark Veterans Day. Trump recently has signaled discontent with the top retired generals serving in his administration, raising questions about whether he is souring on the military brass in his orbit. Earlier this year, he derided Defense Secretary Jim Mattis as “sort of a Democrat.” In Sunday’s interview, he said that there are things Kelly does that he doesn’t like and that at some point he will move on from the chief of staff position. The comments followed the president’s decision to thrust the American military into the center of a political maelstrom ahead of the midterm elections by sending thousands of troops to the border with Mexico in what critics labeled a political stunt to fire up anti-immigrant sentiment among his base. Ahead of the election, Trump said he was sending as many as 10,000 to 15,000 troops to the border, but the military said last week that the number of active-duty troops deployed in fact had peaked at about 5,900. An additional 2,000 members of the National Guard have been there since April. Although Mattis defended the deployment as necessary support for the Department of Homeland Security and good training for troops, other members of the military community took offense at what they saw as a wasteful politicization of the armed forces. Trump’s suggestion that soldiers would shoot migrants who threw rocks at them prompted retired Army Gen. Martin E. Dempsey, former chairman of the Joint Chiefs, to tag the mission as wasteful, while clarifying that men and women in uniform wouldn’t use disproportionate force. Trump, who attended New York Military Academy but avoided serving in the Vietnam War through draft deferments, also answered questions Sunday about why he hadn’t visited American troops serving in combat zones in Iraq or Afghanistan. But former and current administration officials, who spoke on the condition of anonymity to discuss internal deliberations, didn’t recall hearing about the possibility of Trump visiting troops in Iraq, Afghanistan or Syria during his first year and a half in office. An attempt to visit the demilitarized zone between North and South Korea in late 2017 was scuttled by bad weather. Trump has also been a vocal advocate of withdrawing from the conflicts where American troops are deployed abroad, but Mattis and other national security officials have persuaded him to stay the course in Syria and Afghanistan. When Wallace pointed out during Sunday’s interview that Trump hadn’t visited troops in Iraq or Afghanistan, the president was quick to note that he opposed the war in Iraq, although it’s unclear if he ever voiced that opposition before the 2003 invasion. “But this is about the soldiers, sir,” Wallace said. Monetary support for the military has long been at the heart of Trump’s political messaging. Years of budget caps damaged the American military’s preparedness, according to the Pentagon, which says the consistent funding during the first two years of the Trump administration has helped assuage problems with training, maintenance, personnel and equipment. In August, Trump signed a $716 billion defense bill, including a $639 billion baseline budget that was the nation’s largest in adjusted terms since World War II, a 2.6 percent pay raise for troops and critical investments in equipment maintenance. The overall defense budget, which includes active operations, was higher in the Bush and Obama years during the surge in Iraq. In recent weeks, however, the Trump administration has signaled that budgetary largesse for the military that characterized the president’s first two years in office is unlikely to continue. After the federal deficit jumped by 17 percent in part in response to last year’s Republican-led tax cut, Trump ordered government agencies to slash their budgets for the coming year by about 5 percent, which would amount to a roughly $33 billion reduction for the military.